Freedom Worship Center Velburg, in partnership with Restoration in Christ Ministries, is excited to host a special training seminar for those who work with people whose lives have been shattered by severe abuse and trauma resulting in Dissociative Disorders and Post Traumatic Stress Disorders. You will learn the new and groundbreaking Primary Identity Approach developed by Tom and Diane Hawkins for restoring those affected by trauma. While originally designed to resolve the trauma-induced dynamics of dissociation, it provides an efficient way to heal the effects of all kind of trauma in a person's life. 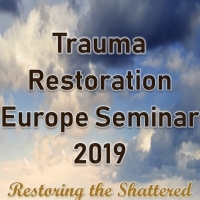 The seminar will be open to anyone to attend, but we specifically seek to help those throughout Europe who are working with individuals who have been affected by trauma resulting in PTSD or Dissociative Disorders (DID). We know that there are only so many seminars that one can attend in a year, and the cost can be expensive. Therefore, in an effort to help as many as possible, we will be streaming the seminar sessions live using Zoom Webinars. During the Questions & Answers time, Diane will be able to take live questions from those on the Webinar. Diane is a native English speaker, but we will also be providing live translation for the seminars in German at the event, and the workbook that Diane has written will be offered in either English or German. The live streaming Zoom Webinar, however, will not be translated at this time. This may change as we learn how many people might need this service and if technologically we are able to provide it. This will be a great opportunity to learn from Diane Hawkins, who has not only learned how to help many people who have suffered from DID but is also a healed survivor, who understands firsthand the effects of trauma and dissociation. "Friendly staff that speaks English and wonderful food at their restaurant." For the Conference rate: Email: info@hotelzurpost-velburg.de and use conference code "Freedom". If you have any questions regarding the conference you may call Pastor Greg Smith at +49-151-24045952. There will be directed parking and security. No child care will be provided for the meeting except for the Sunday morning service.